It’s almost Christmas and the bliss, love and joy of being together that we can breathe in this time of the year is an inspiration to me. Is it possible to recreate the warmth, the wonder and the magic of Christmas in a wedding? 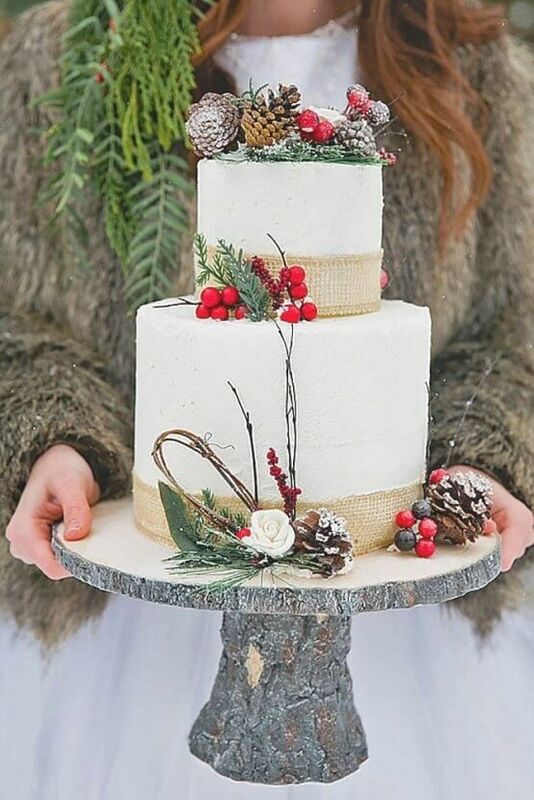 I created for you a moodboard full of ideas and inspiration for a Christmas-themed wedding! ? Christmas is not only red and gold, there are endless color variations that, if well balanced, evoke the Christmas spirit to perfection! For example, I think of nuances of green fir and green leaf contrasted by ice, white and opaque silver. To bring some sparkle to the green that dominates the moodboard I imagine berries and flowers in shades of red. The berries offer discreet color touches with a great visual impact, for a sophisticated and fresh result at the same time. The location can only be a wooden cottage, with lighted fireplaces and wooden beams to decorate with lights and greenery! For the Stationery a play of transparencies with transparent, impalpable vellum paper, handwritten by a calligrapher with gold or white ink. In contrast a floral watercolored fantasy in shades of green, dark red and white. A further detail to enrich the Stationery is a small spruce twig with a refined green-silver undertone! Or even small winter berries with strong colors! For the Tableau I imagine a branch of suspended fir tree, from which the names of the guests are suspended, handwritten on small tags that recall those of the gifts under the tree. The floral arrangement sees the predominant color of the green fir, enlivened by purple, dark blue and dark red berries, white flowers and grape-colored roses. The December bouquet is full of flowers of unique beauty such as buttercups, hellebore, snowdrop and lilies! The bouquet can be enriched with berries, currants, wild strawberries and beautiful silver eucalyptus leaves. Would not it be nice if the Pillow remembered a precious glass and gold decoration, geometric like Christmas tree decorations and full of soft white snow? We need lights for Christmas! It is precisely the warm light of the light catenaries that creates the magical and romantic atmosphere that reigns at Christmas. For the wedding cake, two proposals! A total white cake decorated with red berries and a naked one with wild strawberries, berries, blueberries and currants. For guests a delicious Hot Chocolate Bar corner, where they can enjoy hot chocolate, marshmallows and sweets! And another one courtesy to guests is the corner with a basket full of soft and warm blankets! Here is a Photo Booth to entertain even the youngest guests! A small enchanted forest with fir trees decorated with lights, gifts, skates to go on ice, lanterns and wooden snow slides for unique, funny and out of the ordinary photos! With this dreamy moodboard I wish you a happy Christmas, full of joy and romance! My name is Caterina Testardi and I am a Destination Wedding Planner and a Wedding Designer. I organize weddings for Italian and foreign couples fulfilling their small and big desires.